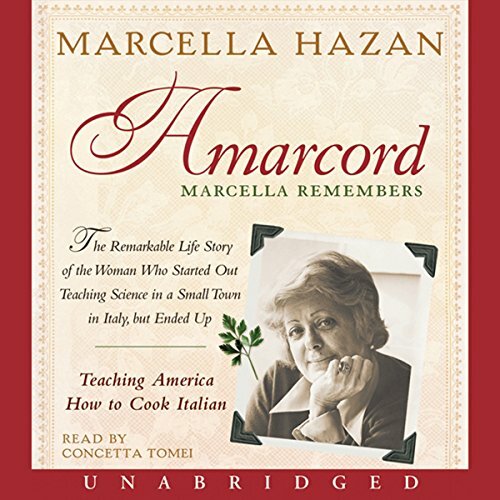 Marcella Hazan is known as America's godmother of Italian cooking. The owner of her own cooking schools, and author of best-selling and award-winning cookbooks, she has collected invitations to cook at top restaurants around the world. Her story begins in Alexandria, Egypt, where an early childhood accident would alter the course of her life and bring her family back to her father's native Italy for medical treatment. In Italy, Marcella was fulfilling her ambition to become a doctor when she met Victor, the love of her life. After their marriage, they moved to America, where Marcella knew not a word of English or a single recipe. She began to recall and attempt to re-create the flavors of her homeland, giving cooking lessons in her tiny New York kitchen. Soon after, Craig Claiborne invited himself to lunch, and the rest is history. Amarcord means "I remember" in Marcella's native Romagnolo dialect. Marcella, now 84, looks back on the adventures of a life lived for pleasure and a love of teaching, and the twists and turns that brought her love, fame, and a chance to forever change the way we eat. I wish I had bought a Hard copy, I feel I lost a lot in the transcription.